Short breaks where available are mon to fri and fri to Monday. Seacove is a modern maisonette apartment with 2 bedrooms and 2 bathrooms set in the heart of the village. It benefits from free parking and Wifi. Set just 200 yards from Saundersfoot's main beach and less than a minutes walk to the many shops, bars and restaurants on offer. Pembrokeshire coastal path is easily accessible. Tenby, Amroth and Narberth are just a short drive away as are the many places to visit in Pembrokeshire. One well behaved dog welcome. Parking permit provided for the harbour car park which is 150m away. The open plan kitchen benefits from Fridge with ice compartment, dishwasher and microwave. Gas hob and electric oven. Kettle, toaster and sandwich maker. Notes on accommodation: 1 quiet well behaved dog welcome Please check pricing, minimum stays and changeover days before contacting the owner Utility Room: Small utility cupboard housing combi boiler and washer dryer. Cleaning / Towels / Linen / Maid service: Towels and linen are provided. Beds are made up for arrival. Other: Seacove has a private entrance wits stairs leading to first floor which includes twin room, bathroom and open plan lounge and kitchen. Stairs from lounge leading to second floor which includes double bedroom, en suite and small utility cupboard. 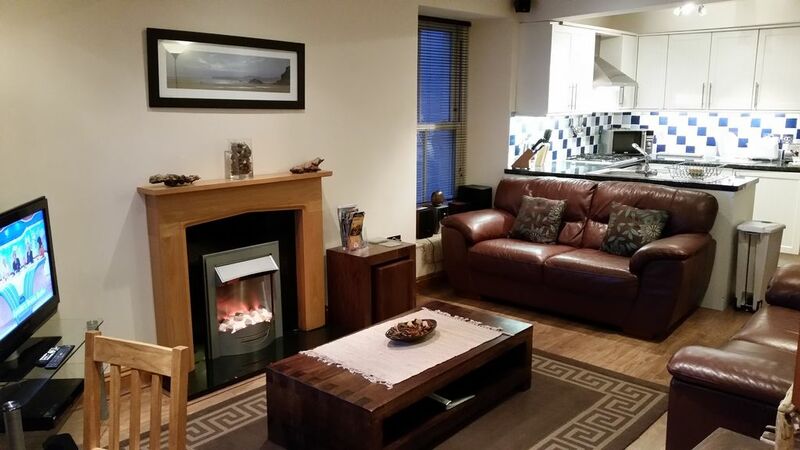 A lovely midweek stay, in this perfectly located first floor apartment. Just a short walk to the beach. Perfect for walks on to coastal path. Good local bars and restaurants. If your into your real ales try the HARBWR bar and restaurant great local beers and excellent food . Hope to return soon. Lovely, spacious, dog friendly apartment over 2 floors. Parking permit provided for harbour car park. No parking close to property but a few 30 min spaces around the corner for loading/unloading. Not ideal but manageable. Right in the town centre with shops, bars and restaurants a minute away yet far enough up the street to miss the worst of the bustle. Side sea view from the bay window in the living room . Beach a few minutes walk away. Nice welcome pack! Just spent a lovely week, apartment was perfect, would defiantly recommend it right in the heart of town and a short walk to the beach.. brilliant...thanks.. Relaxing property in the heart of Saundersfoot. We had a wonderful holiday in Saundersfoot, visiting many of the beautiful nearby beaches and castles. In the evening the Royal Oak, just 2 minutes away, was a relaxing way to spend evenings with excellent local beer and reasonably priced meals. The accommodation had everything we needed; at times it was too comfortable and responsible for a few late starts !! Thank you to the property owner for sorting out our key dilemma soooo quickly (apologies again 🤡🤡) Would definitely recommend this property and hope to return. Absolutely perfect location & accommodation for a family of 4 & pet dog. Felt like home. Apartment was clean, tidy & well equipped for self catering. Great lay out for a family. Beautiful sea views too. Short walk to beach & lovely shops. Fantastic break & a wonderful part of the world. Would certainly book again. The main beach is approximately 200 yards away. Tenby, Amroth and Narberth within 5 miles. The nearest main towns are Haverfordwest and Carmarthern approx 20 miles. Saundersfoot has many shops, bars and restaurants. Booking Notes: A 25% deposit is required to secure a booking. The balance is due 4 weeks before the booking. Payments are collected by an automated system. A credit/debit card is required. Changeover Day: Changeover day is a Friday. Notes on prices: Short breaks are only available during the cheapest priced weeks. Short breaks will be considered for other weeks if available within one week of the start date.